Astrom Editions AB - Myth, Drama and Style in South Italian Vase-Painting. 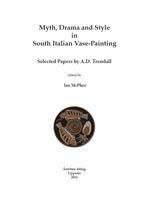 Myth, Drama and Style in South Italian Vase-Painting. Selected Papers by A.D. Trendall. Edited by Ian McPhee. Uppsala 2016. 340 sidor.